Use an image in which clicking in different parts triggers different acts. Often seen on a web page, now anyone can use the same technique in an Excel sheet or in an userform. In an userform using an embedded web browser. This lets one share the same code between Excel and a web page. Download the zipped files containing the examples below. Note that the workbook contains macros. You must enable macros in the workbook to successfully view the demonstrations. The same example is used to demonstrate the different methods. The example consists of a map of the U.S. In the downloadable file, the two states in the Northwest corner, Washington and Idaho are 'clickable.' Move the mouse over either and click. 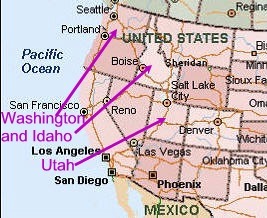 You will see the postal abbreviation for the respective state, WA for Washington and ID for Idaho. In an userform using an embedded web browser.